Mint is a very popular and common herb available. The natural mint leaves are used to make curries etc. in India. Not only these, but mints have many health benefits associated with it. In this post, We are going to discuss the various health benefits of mint. Since ages, mint leaves are used to treat various health related problems and is used in making medicines. Read on to find the various health benefits of mint. 1- It helps in soothing the digestive tract. 3- Mint helps to reduce the growth of fungus and bacteria. 4- Mint leaves are known to cure asthma. 5- Mint combats bad breath. 6- It is also used to whiten teeth. 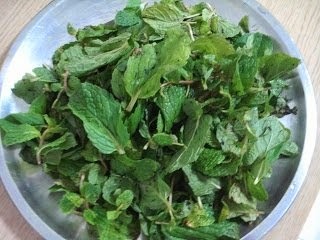 7- Grind the mint leaves to make a paste to cure insect bites and stings. 8- Mint is also used to prevent skin, colon and lung cancer. 9- Min can help you in relieving from pains and aches. 10- Mint is a great blood cleanser. It helps in cleansing your blood and improves your blood circulation. So, these were the health benefits that are associated with mint. You can include mint in your daily diet, make shakes, add in curd, curries etc. in order to reap benefits from mint.